U.S. warplanes pounded dozens of insurgents hiding in caves in southern Afghanistan, the military said Monday, after a gunbattle between the militants and U.S. troops. An American soldier was killed and two others wounded when a bomb hit their patrol in a separate incident in the violent southern province of Urzugan, the U.S. military said. The explosion hit the Humvee near Deh Rawood, 250 miles southwest of the capital, Kabul, spokeswoman Lt. Col. Michele DeWerth said. Meanwhile, Taliban militants killed two policemen south of the capital and threw a grenade at a relief group in the northwest, officials said, fresh signs that violence is spreading ahead of crucial national elections. The planes struck early Sunday near Tirin Kot, a town 250 miles southwest of Kabul where U.S. Marines recently set up a base, military spokesman Lt. Col. Tucker Mansager said. The militants sought refuge in the caves, and coalition forces called in "air support that dealt with those caves," Mansager said. He said no U.S. soldiers were hurt and had no information on any casualties among the militants, who he said numbered "probably in the tens and twenties." More than 400 people have died in violence across Afghanistan this year, most in the south and east where U.S. forces and Taliban militants have clashed repeatedly in recent weeks. The U.S. military has assembled 20,000 troops, its largest-ever force in Afghanistan, in an attempt to keep militants on the defensive in the run-up to the vote. But there are signs that the insurgency is expanding. Militants opened fire on U.S.-led forces Friday with small arms and machine-guns north of Spin Boldak, a town on the Pakistani border, Mansager said. There were no reports of injuries, but five militants were detained. The policemen died when Taliban attacked the government office in Kharwar, a remote district of Logar province just 50 miles south of Kabul, said Gen. Atiqullah Ludin, a local military commander. He said about two dozen assailants rode into town in four-wheel-drive pickup trucks and opened fire with guns and rocket-propelled grenades, setting fire to one office. Ludin said two police officers were killed and another injured before the Taliban withdrew into the mountains. An Interior Ministry spokesman in Kabul said only one policeman had died. The Logar attack comes less than a week after five medical relief workers, including three foreigners, died in northwestern Badghis province in an attack claimed by the Taliban. Badghis police chief Amir Shah Naibzada reported a fresh incident Monday: a grenade attack on another relief group in the provincial capital, Qalay-e Naw. The grenade was tossed over the wall of the group's compound late Sunday, shattering windows but injuring no one, he said. The relief group wasn't identified. Naibzada said the Taliban were probably to blame but also alluded to factional tensions in the region. Aid groups worry that relatively secure provinces such as Badghis and Logar will join the south and east in being too dangerous for badly needed reconstruction work. The violence is also a threat to plans to hold elections in September. Militants ambushed a U.N. convoy of election workers in southeastern Paktia province on Sunday. Guards and the assailants fought a pitched battle, but no one was hurt. Afghan President Hamid Karzai insisted last week that the vote should go ahead, though the United Nations, which is scrambling to register millions of voters around the country, says security must improve. A 2,000-strong Marine force was recently deployed in southern Afghanistan to step up the hunt for al Qaeda and Taliban holdouts. Some 20,000 U.S. forces — up from 11,000 at the start of the year — are now in the country, trying to secure volatile areas in the south and east ahead of the crucial elections. 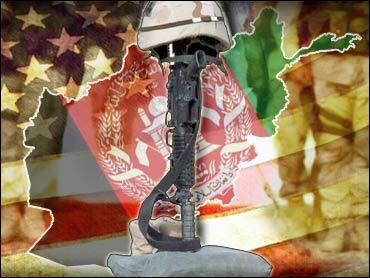 Last week, U.S. and Afghan troops backed by American warplanes killed 17 militants in the mountains of southern Afghanistan. But after the attack on aid workers led Medecins Sans Frontieres, which has nearly 1,500 staff in Afghanistan, to suspend its operations across the country. A General Accounting Office report released Wednesday — while crediting U.S. aid for helping to avert a humanitarian crisis — found that in the last two fiscal years "the postconflict environment in Afghanistan threatened progress toward U.S. policy goals, and poor security, increasing opium cultivation, and inadequate resources impeded U.S. reconstruction efforts."